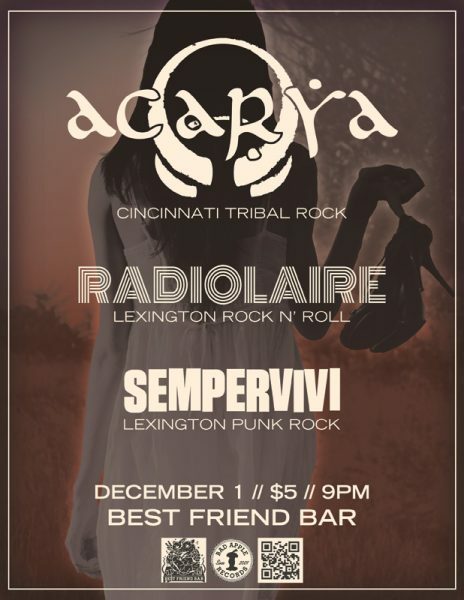 I created this flyer design for a tour date my longtime friends Acarya were playing with my project Sempervivi in Lexington. They are a Cincinnati based band with a unique, percussive sound they describe as “tribal rock”. They combine both acoustic and electric guitars with a customized drums and percussion instruments. Alternate tunings, as well as chanting vocals get their audiences’ feet tapping and heads bobbing. In keeping with the band’s earthy vibe, I chose a stock photo of a mysterious female walking in a field surrounded by woods. I first reduced the colors to black and white. Then, I cut out the figure to separate it from the background. I did this so I could color her in a separate tone from the rest of the image. I only slightly toned the central figure in a faint creamy yellow. Next, I gave her a nuanced glow to create an otherworldly effect. I colored the wooded background in shades of rusty orange and red. I was careful not to make the background too bright and overpower the text in the foreground. Finally, I added a faded black overlay and inner shadow. Because of this, the image retains a dreary, blurry feel, not unlike one of my favorite horror films, The Ring. Since I had logos for each of the bands on hand, I decided to incorporate them. I overlaid each element in the foreground with a dingy yellow. They are still bright, while not overpowering the background image, as I felt they would in white. All of the band genres, date, venue, and other information is set in light weights of the Trade Gothic font. I added logos for the venue, my record label, and a QR code for the Facebook event at the bottom. Last, I framed the it all with a fine inside stroke. I have been designing posters for bands and concert events since I started in 1999. Contact me today for your own flyer design.